-Rob Gronkowski, (May 14, 1989- ), New England Patriots tight end, 2× Super Bowl champion (XLIX, LI), 5× Pro Bowl (2011, 2012, 2014, 2015, 2017), 4× First-team All-Pro (2011, 2014, 2015, 2017), NFL Comeback Player of the Year (2014), NFL receiving touchdowns leader (2011), Third-team All-American (2008), First-team All-Pac-10 (2008). The 26th Annual Wye Island Regatta will be held today, September 8, 2018 at Wye Landing, Wye Island on the Wye on the Wye East River in Wye Mills, Maryland. Annapolis Rowing Club hosts 78 entries from 34 clubs. Springfield Rockrimmon Regatta will be held September 8, 2018 at Connecticut River in Springfield, Massachusetts. Pioneer Valley Riverfront Club hosts 92 entries from 29 clubs. Tennessee River Gorge Row will be held September 8, 2018 at the Tennessee River in Chattanooga, Tennessee hosted by The Lookout Rowing Club. In Canada, the 7th Annual Muskoka Fall Classic will be held September 8, 2018 at Gull Lake Rotary Park in Gravenhurst, Ontario. Severn River Rowing Club hosts 185 entries from 24 clubs. Coupe Québec Jeunesse d’Aviron de Sherbrooke will be held September 8, 2018 at Park Jacques-Cartier on the Magog River in Sherbrooke, Quebec. Sherbrooke Rowing Club hosts 94 entries from 8 clubs. Head of the Reach will be held September 8, 2018 in Deas Slough, Delta, British Columbia hosted by Delta Deas Rowing Club. Head of the Red planned to be held September 8, 2018 in Winnipeg, Manitoba has been cancelled by Winnipeg Rowing Club. Chester Le Street Regatta will be held Saturday 8th September 2018 in the Northern region hosted by Chester-le-Street Amateur Rowing Club. Worcester Autumn Regatta will be held Saturday 8th September 2018 in the West Midlands region hosted by Worcester Rowing Club. What’s that, you say? Treadmills without motors, is that even possible? A resounding yes, yes, yes is the answer called to action by your feet. Treadmills, the most used piece of exercise equipment in any gym is going old school. That’s right, what’s old is new again, and in this case you just need to look down below to your feet. Manual treadmills are showing up in edgy, high-end health clubs forgoing the digital, electronic connection we all rely on. The newly resurrected, childlike conception of a treadmill looks to a hamster’s flywheel for inspiration. There is a concave surface instead of flat tread and one moves by their own power just like a hamster on a flywheel. Personal gravity becomes the accelerator and the brake as forward is go and backward is to stop or slow down. And all your personal gravity and effort adds up to burning more calories than traditional treadmills. Perfect for a diversion from the erg, short burst workouts or to rotate through the rest of your training. 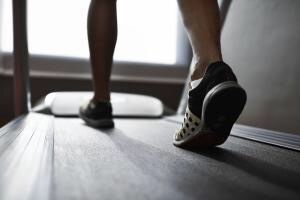 According to the Wall Street Journal, up to 30% more calories can be burned on non motorized treadmills like the Woodway Curve of Waukesha, Wisconsin or the TrueForm Runner by Chapco. Star Trac plans to add a motorless treadmill with an incline to its lineup of treadmills sometime next year. The digital displays are battery operated to keep track of progress, no need for an electric outlet with this baby. You can work out during a power outage or alone on a deserted island. And these treadmills take up less space and are quieter too. Then again, the original treadmills without borders, a.k.a. our own feet, take up no room at all. Grit Fitness Festival will be held today, January 21, 2017 at the Hampton Road Convention Center in Hampton, Virginia hosted by Crossfit Oyster Point. This is a Concept2 Non-Satellite event.